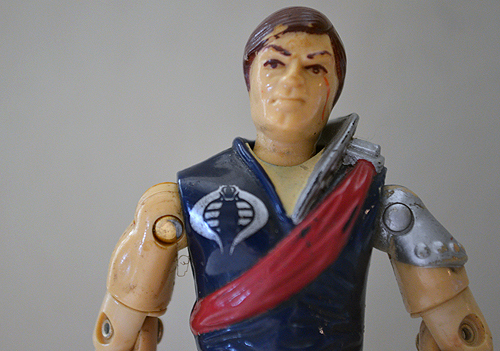 Tomax has seen better days, but hey, at least he’s better off than his brother. Tomax has survived being tossed around, packed away and stuffed in a bag. And unlike his unscarred brother, Zamot, he’s kept himself together. That’s not to say that he doesn’t have some wear-and-tear. Tomax shows signs of being nearly 30 years old. 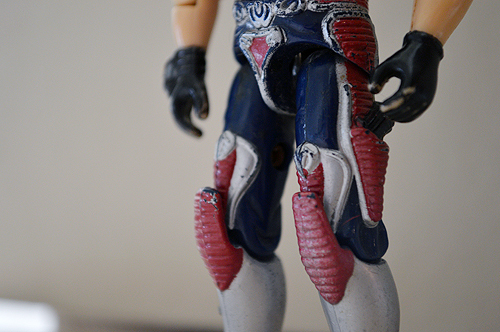 His hair has worn away in places, his red sash is looking a little blue, and his steel shoulder pad has chipped a bit. Tomax could use a fresh coat of paint. The red pads on his legs and thighs bear the marks of being used. He and his brother were regularly used back in the day. His hands, too, have lost some of their perfection. Yet somehow this guy stayed together. His brother will be featured in an upcoming post. He required a bit of reconstruction. Sadly, the twins didn’t hold on to either of their accessories. The gun and zipline that belonged to Tomax are long gone.